WILMINGTON, Del.--(BUSINESS WIRE)--Chase Card Services, a division of JPMorgan Chase & Co. [NYSE: JPM], today announced Chase Sapphire ReserveSM credit card – the newest addition to the luxury credit card market. 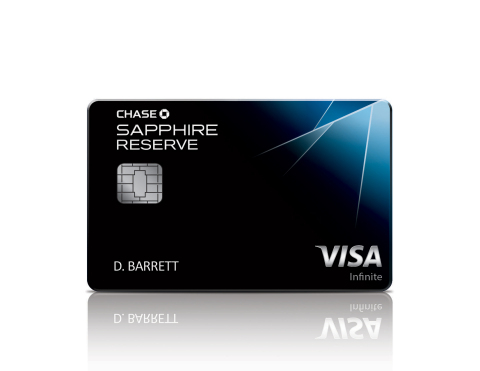 Chase Sapphire Reserve joins the suite of Chase Sapphire’s premier rewards cards and sets a new standard for credit card benefits, including 3X points on a wide range of travel and dining purchases, flexible redemption options and valuable travel credits. Chase is the U.S. consumer and commercial banking business of JPMorgan Chase & Co. (NYSE: JPM), a leading global financial services firm with assets of $2.5 trillion and operations worldwide. Chase serves nearly half of America’s households with a broad range of financial services, including personal banking, credit cards, mortgages, auto financing, investment advice, small business loans and payment processing. Customers can choose how and where they want to bank: 5,300 branches, 18,000 ATMs, mobile, online and by phone. For more information, go to Chase.com. Chase Card Services announces Chase Sapphire Reserve credit card – the newest addition to the luxury credit card market.